We create multimedia specialists for a ubiquitous generation.The aim of this department is to produce professional printing experts who have high abilities in using pre-presses, presses, post-presses, and special printing methods based on digital skills and a creative mind. We have the largest printing room in Korea. To cope with the digital environment and development of new electronic printing methods, we are training students to handle mass media and information sources. 1. To study basic to advanced general printing process theories. 2. To learn how to use basic digital skills in information society as well as functions and applications of printing media. 1. To study the usage and application of programs for tone reproduction in information media. 2. To be printing experts and have extensive professional knowledge from various digital information sources. 1. To emphasize practical education using real world up-to-date facilities. 2. To produce experts who have professional skills and knowledge of mass media. This is the first level for learning basic conversation English. This course concentrates on basic communication skills but focuses primarily on listening and speaking. This course cultivates the basic skills that are necessary for English conversation by studying some basic vocabulary through repetition. The aim of this course is to guide our students in choosing the most suitable career for each one of them.? This lecture focuses on outlook, aptitude, ethics, attitude, appreciation of success and problems that occur not only in life but also at work. This course looks at the overall flow of Korean culture. Students study the principles in which our culture was created by looking at the characteristics of Korean sentiments, royalty versus common people’s culture, etc. This course aims to contribute on the improvement of enjoying a variety of cultural activities.Students learn the methods on how to enjoy and appreciate publications, plays, movies, etc. from a variety of fields. This course studies the design elements that are intimately related to life. Students get to study color and formative arts that are materialized visually and they also look at the principles of what stimulates the mind. This course takes English to a deeper level and expands the extent of its use. Students get to improve on their English speaking skills by practicing authentic conversations that are appropriate in certain settings. Based on basic theory of off-set printing, Practice on Off-Set Printing cultivates control ability of monotone printing production and off-set printer by systemize structure, principal, and theory. This course aims to improve on basic physical strength, which is the foundation for improving mental health. This course lectures to help students maintain good mental health and also maintain their physical health by doing simple exercises. This course teaches students about understanding the internet, which has become a crucial element to our lives. Students not only learn the ways of using the internet, but also about internet etiquette so that it contributes to the expansion of a healthy internet culture. Students study the basic theories to understand the characteristics and similarities about all the different kinds of image reproduction methods. This course also teaches about the theories of processing and manufacturing methods of graphic arts, and production and quality management. Students learn about possible page layouts considering the text in order to establish the basics of producing print manuscripts. This is achieved through understanding and application of digital fonts. Students learn how to use and apply Adobe Photoshop, a program that is used the most in producing digital images. This course teaches the basic knowledge and techniques of prepress functions, on-line work, photography, halftone photography, film layout and separation that are the basis of plate making. This course cultivates the ability required in material selection, material reduction and printability improvement by learning about production methods, properties, physical properties and quality test methods of printing paper and ink that are often used in large quantities among the printing materials required in the printing production process. This course teaches theory and allows students to practice producing printable goods using a variety of mediums. This class provides the most basic practice for reproducing special prints with materials aside from paper. Students study more advanced theories to understand the characteristics and similarities about all the different kinds of image reproduction methods. This course also teaches about the theories of processing and manufacturing methods of graphic arts, and production and quality management. Students learn about fonts and image editing methods through the practice of creating page layouts using text and images. Students establish the fundamentals of prepress by using copy data. Students learn how to manage vector images through the use of Adobe Illustrator. Students also use the editing program, Quark Xpress, to produce planning goods and they systematically establish the progress of digital process. This course is taught to provide an overall understanding of the basic curriculum that is learned by students in the Information and Media field. The five departments that are found within this field are: Graphic Arts Media, Photography and Image Media, Computer Information Processing, Media Contents and Internet Information Technology. This course helps students understand and convey the basic knowledge and skills of everything from CTF, CTP and prepress to the basic skills of the press, having the prerequisite course “Practice of Image Reproduction I” as a background for this course. Knowledge required for improving in material selection, material reduction and printability can be obtained by understanding the properties and physical properties of photo sensitive material, process film material, plate-making material, plate material, special image recording material, etc. that are required in the printing production process. 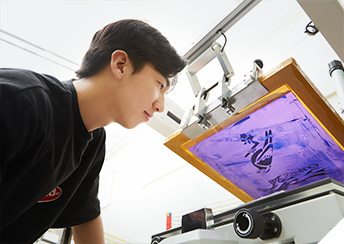 This course studies the theories and practices about image reproduction methods using a variety of printable goods, and characteristics of plate making and material selection by practicing plate making and screen print. This course studies the basic theories about the various mediums of advertising print, and publications along with other various media that are needed for the advancement of our information society. This course enables students to understand the concepts of general electronics and analog to the general overview and application of digital sources, and provides opportunities to print using image information media such as the latest prepress, digital press, etc. Students become familiar with the use of digital media and they learn how to use drawing software programs to improve the efficiency of the use of current print media. Students in the departments of Photography and Image Media, Graphic Arts Media, and Media Contents, get a hands-on experience by completing this project. Lithographic Printing cultivates effective printing management by teaching about applications of the latest equipment and structures, types, and principals of lithographic printer based on basic theories. Students establish a background in print productions by understanding the principles and characteristics of the following: scanning skills needed for image reproductions, digital color adjustments, color image system, direct digital printing plate system, entire page composition system of text images, and electronic plate-making. Printing Sales builds up the capability to adapt to certain activities at the printing site such as product service and provision of data necessary for customers, idea provision, and satisfying individuals or organizations. Theory and practice will be instructed to apply on the special fields according to the trends of digital science skills and printing work and products produced from various media. Students will be able to print using special plates that will allow them to print on special mediums or paper. Students learn about the entire color printing process and how to evaluate maintenance of printing matter such as plates, plans, and digital editing. They learn to understand the functions of a variety of manuscripts needed for color printing such as picture management, film processing (CTF), image editing, and scan input. In order to prepare for employment, students cultivate the knowledge needed to perform actual duties. As a result, students must understand the marketing tools of advertisement, print, and planning. This course is to cultivate technicians who are equipped with the knowledge for handling and using all kinds of print mediums. The students in the majors of Graphic Arts Media, Media Contents, and Photography and Image Media are given the opportunity to create actual sample productions using a variety of mediums. This course helps to understand the principal of color separation and digital productions that are the basis of color printing. Students are able to understand the operation, types, system and performance of the main body and surrounding parts and they have the ability to apply on color printing. Digital Press teaches about waterless printing that is recently being used and the types, structures, and principals of digital printers. It identifies types and purpose of materials and teaches about the advantages and disadvantages compared to the existing printing methods. Theory and practice will be instructed to apply on the special fields according to the trends of digital science skills and printing work and products produced from various media. Students will be able to print using special plates that will allow them to print on special mediums or paper, especially using photo printers and floaters. Based on Theory of Image Reproduction I, students learn about the print aptitude and electronic plate making characteristics, which are needed for printing, on a deeper level. Students cultivate the knowledge that can be applied on site. This course teaches our students the production methods of variety of materials through practice, so that when they are in the field they may be able to use it synthetically. They learn about the planning, design, operations, statistics and basic concepts about producing printing materials. In addition, in order to improve on production abilities, students come to understand production costs, design plans, inventory control, quality management and setting of standards. Students get the opportunity to work full-time as interns in the industry. Students learn the skills that are necessary for working in the real world by experiencing the same treatment and responsibilities just like real employees. As a result, students increase their ability to adjust to the real world after graduation.